Interpublic’s Magna and IPG Media Lab units today will publish findings of a scientific market trial indicating that interactive video ads shown on tablets, desktop and mobile devices generate attention levels comparable with television ads. The report, entitled “The Interactive Effect: A Key to Surviving in the Attention Economy of a Mobile-First World,” finds that interactive video ads extend the amount of time that consumers pay attention to a brand by 47% over non-interactive video ads. The study, which was conducted with Tremor Video DSP, was based on a panel of 2,157 online users who downloaded a custom app to view video content at their own discretion. 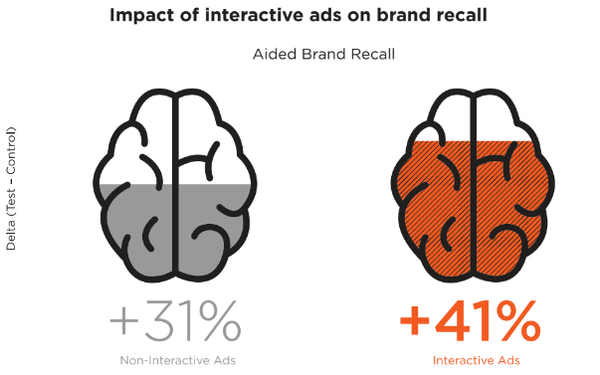 It was not clear from the data provided by the Interpublic units what role, if any, wear-out might play in engagement and attentiveness levels -- but the study concluded that interactive video units make ads “32% more memorable than non-interactive ads,” regardless of whether consumers actually interact with them or not. Brands participating in the trial included Amazon, Arby’s, FCA, and MillerCoors. Details on the creative and interactive execution were not provided at presstime. 2 comments about "IPG Units Find Attention Levels For Interactive Video Ads Comparable With TV's, Shorter Isn't Necessarily Better". John Grono from GAP Research, October 5, 2017 at 7:11 p.m.
Beibg devil's advocate here, the veracity of this hinges largely on the definition of "interactive" and "interact". For example, when I watch broadcast or cable TV, I find that I tend to only interact with the very worst ads. That is, I switch the channel. The inherent assumption that interaction is always good does not always hold. Ed Papazian from Media Dynamics Inc, October 5, 2017 at 7:50 p.m. So what we have here may be a form of "invited viewing" of an app containing the two kinds of ads. Fine, that's not unusual as a way to obtain a sample of sufficient size at an affordable cost. Some questions. Was TV measured in the same way for non-interactive commercials for the same brands? If, not, how was it determined that the recall was about the same as TV---by using the Nielsen norms for aided recall? In that event, it should be pointed out that when people are invited to watch a TV telecast so the researchers can later contact them and ask ad recall and other ad-related questions, the viewers, knowing that they will be interviewed about the show, give it far more attention than they normally would and this carries over to the ad measurements---producing recall scores that are often twice what you get when the viewer watches the show without knowing about any post exposure interview. If this is what we are referring to, than comparisions with Nielsen's TV recall norms are misleading as Nielsen does not---as far as I know---invite people to watch shows prior to quizzing them about ad impact.